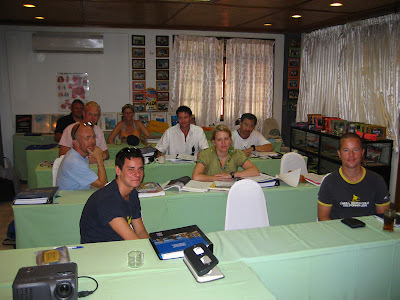 PADI, diving and Instructor Development (IDC) around Thailand: First IDC of 2008 about to kick off! First IDC of 2008 about to kick off! Tomorrow the first IDC of 2008 starts! Today we completed the prep course. It shows a fairly crowded classroom, there are 9 IDC candidates and 5 IDCS participating. In this picture we can see Adam, Gideon, Fred, Ulrike, Simon, James and Marcus. On the back row are 3 IDCS; Paul, Chris and Wahid. 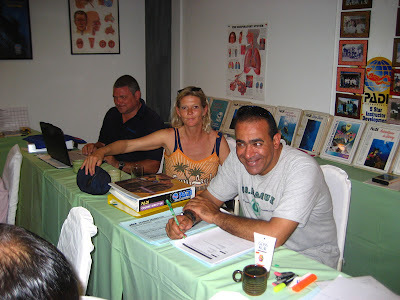 Chris and Wahid work in Sharm El Sheik in the Red Sea and are having a work vacation, during which they staff this IDC. 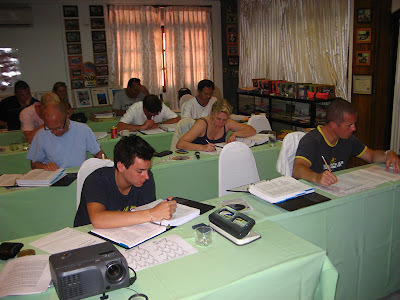 This picture shows everybody sweating it out during one of their exams. Today, first thing in the morning we went to the pool. The sun was burning so fiercely, we all got sunburned in our faces! Tomorrow the real IDC starts and I'll try to keep you updated on the progress.